At 3D Fixtures, we believe that 3D printing can improve the product development and production process in a number of ways – but we also know that complex projects will always demand more than just one kind of manufacturing technique to come to full fruition. That’s why we recently undertook a project with our sister company, Sunstone Circuits: to explore and demonstrate the complex and complimentary roles of traditional electronics manufacturing and 3D printing in the product development cycle. To help keep our project grounded in reality, we chose to follow along with a recent trend in consumer electronics manufacturing – the smartwatch. Because we wanted to focus on the manufacturing aspects of development, we based our design on an open-source project. Our first step was to reproduce a working version of the open source, COTS (commercial-off-the-shelf) electronics. 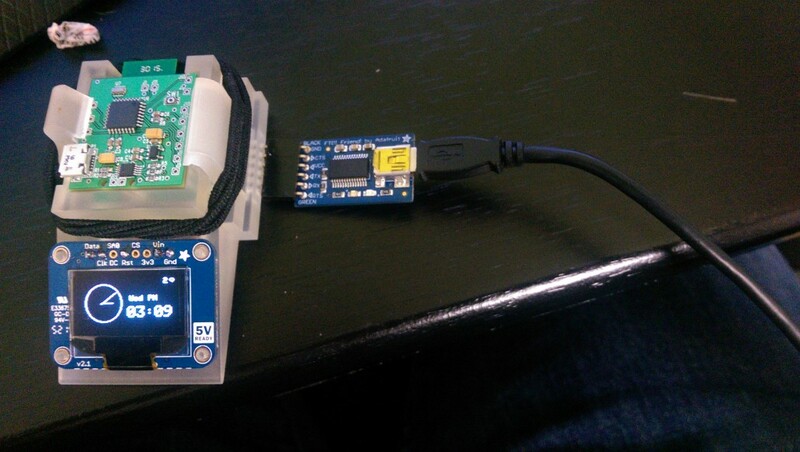 After the combined team, using the open source system as a baseline, settled on a specification for the electronics, and split up temporarily. While Sunstone Circuits went into production on the boards, 3D Fixtures went to work on mechanical prototypes and production tooling. We took full advantage of the capabilities of our 3D printer in designing our prototypes, enabling us to iterate quickly and produce 3 unique designs using the same internal components but with widely varying appearances and user experiences. The precision of our 3D printer let us forgo fasteners for our parts in favor of press- and snap-fit joining. We didn’t just iterate on the watch exteriors, though. 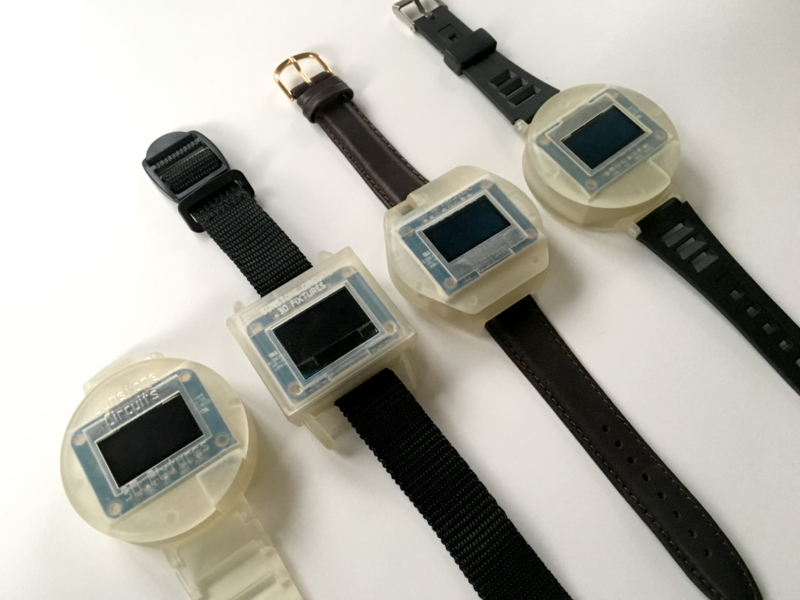 Although we knew we would only be making a handful of watch prototypes for this project, we wanted to keep the whole new product development cycle in mind. At the same time as we were experimenting with different designs, we were improving the process of assembly and testing for the watches. The internal features of the watch enclosures went through as many revisions as the exterior – the final designs could be assemble much more quickly and reliably, using easier motions that, compared to the initial design, would have been much more suited to a production line. Even more importantly, we developed a 3D-printed tool to make the process of programming and testing the electronics a fast, straight-forward process. Without the tool, programming the blank boards would have either meant soldering and de-soldering multiple connections, or else adding specialized headers or connectors to the board – increasing cost and taking up valuable space on the board – and testing boards for full functionality prior to final assembly could have been similarly involved. Thanks to the ability of our printer to produce highly precise geometry, we were able to produce a single tool that combined the programming and testing steps into a single, easy process. The programming jig features a socket that holds the boards in place on a set of spring-loaded contact pins, which align with the same through-holes used in the final assembly process. The socket is biased to only allow entry in the correct orientation, and spring-loaded retaining hook allow the boards to be pushed in on easy motion and removed just as easily. Once the board has been programmed, the same jig allows full testing – a display is connected alongside the programmer, and properly working boards automatically boot using it. If you would like more details on this project, we invite you to download the case study from Sunstone Circuits case study page.